It is always a wonderful and terrible moment, when you finally have the last book in a series. This particularly historical romance series is one of my favorite - all three of the books were quite good, and did not let me down! I can't decide which is my favorite - I loved I Married A Duke, I Adored A Lord, and this one, all for different reasons. 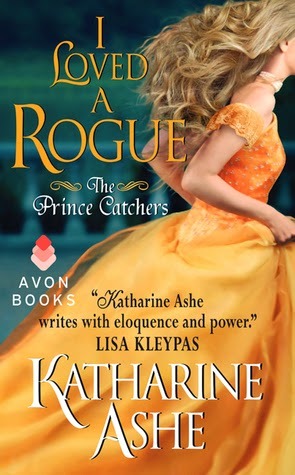 In this final novel of the Prince Catchers series, it's up to Eleanor, the oldest Caulfield sister, to find a prince and find the truth about the Caulfied girls' parents. When her foster father (the vicar) marries, Eleanor decides to go on an adventure - to find out what happened to her parents, prince or no prince. But at the insistence of her sisters, she is accompanied by a guest at the wedding, a man from Eleanor's past, the one boy that captured her heart - and then left. Taliesin is a Gypsy, and a former pupil of the vicar. He left Eleanor when they were young for a good reason - but he is back, and he agrees to accompany her on the mission. Together, Taliesin and Eleanor seek the truth about the girls' parents. Immediately, I knew I would like Taliesin. He's a Gypsy, so he's not all that accepted by the British. He's an educated Gypsy - the vicar took him in for education at a young age. He lived with his uncle though. Taliesin met Eleanor through education with the vicar. He always had a thing for Eleanor, and one day, that thing went places. The next day, Taliesin left - but not because of things with Eleanor. Unfortunately, that's what Eleanor thought. Years later, when he shows up for the vicar's wedding, Eleanor isn't all that happy to see him. Taliesin is all kinds of complicated and hawt and wonderful and brooding. And not any of the cliche stuff (in my opinion), although that in itself sounds cliche. Just in a physical sense, Taliesin is different, and had to work very hard to create a decent reputation for himself. He is very good with horses, so he buys and sells them for a living. Eleanor is kind of like that single young maid auntie who wants to stretch her legs and see the world, but has been taking care of Pops the whole time because she's the eldest. Now that the vicar has married, Eleanor is basically free to do as she pleases. So, with Taliesin (much to her chagrin at first), she searches for clues as to what happened on the ship that brought her and her sisters here. I loved that there was history between the two protagonists - whereas in the previous two novels, the protagonists had never met each other before. Eleanor and Taliesin's reunion is a bit boring (we aren't given the entire past story at once), but we slowly get pieces of what happened between them when they were younger. The romance is pretty slow and progressive, and at one point, I was worried about the introduction of a new male, and a new female. But there was nothing to worry about, because there would be no love triangle of any sort in this book. I loved the romance - I wanted a little more fire and chemistry, but I definitely enjoyed Taliesin and Eleanor's relationship. The mystery is indeed solved! Eleanor and Taliesin cobble together the truth about the girls' past - it's actually quite complex. I didn't think things would get so complicated and intricate, but in this book, all is revealed. I'm impressed by Ashe's big reveal - simply amazing! Like I said, perhaps I wanted a little more from the "romance" aspect of the book. The plot (the mystery of the parents and the ship and whatnot) eclipsed the romance for sure - which isn't necessarily a bad thing! I'm just a voracious romance reader and wanted more romance. But that's okay. Yes! This one! The whole series! Actually, I'd definitely recommend the entire series because of the mystery that threads the books together. You can read each book by itself, without reading the others, but it's worth the time and money to read all three, in order! But you don't have to read them all or in order. 4 stars. A lovely conclusion to a wonderful historical romance series! Definitely one of my favorite series - and I will certainly be reading Ashe's books in the future! I don't read a lot of historical romance (if I do, its only of the YA kind) but this series seems truly fantastic! And yes, I agree, it's exciting but terrible when you reach the very last book to a series. Awesome! I've read a few of Ashe's novellas and a stand-alone novel and really enjoyed them. I'm def. going to have to start this series soon though! Thanks for the review. That is so great to hear! I hope you love this series. Thank YOU! I guess I ought to add the whole series to the Alyssa Recommends list? Glad to hear that the final book was equally good as the previous ones and everything was solved!! Perhaps! If you're up for the historical romance novels. I don't read many historical novels, but your review has sold me :-) Sounds wonderful!! Thank YOU, Carina! And I know adult books aren't your thing, but adult romance novels - especially historical romance novels - are my guilty pleasure!